Due to an incredible amount of activity in the world of original Mark Twain memorabilia, this page is updated on an irregular basis. 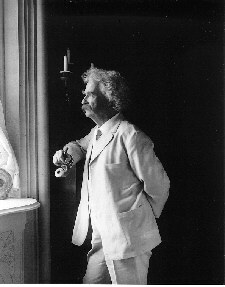 August, 2005-- The Fifth International Conference On the State of Mark Twain Studies was held on the campus of Elmira College August 4th-6th. Attendees unanimously called it a tremendous success, and with good reason. Over 50 papers were presented by scholars from various countries including Austria, Germany, several from Japan, & even one from Mongolia! The United States of America was well represented from as far away as Hawaii. Attendees were graciously wined & dined in such a way that even Mark Twain himself would have been mightily impressed. The first evening reproduced the famous 70th birthday dinner at Delmonico's complete with a souvenir menu & bookmark. The next dinner had an Eve's Diary theme. The last evening was the grand finale -- an amazing barbeque picnic at Quarry Farm. The party started Thursday August 4th with a wine tasting of local Finger Lakes wines and a special exhibit featuring large photographs of Mark Twain and also pictures taken by his daughter Jean. Jean was a very talented photographer, and a particularly moving life size image of her mother at peace on her deathbed in Italy was exhibited for the very first time. Another special exhibit of original Mark Twain memorabilia featuring expressions of love for his wife Livy was on display at the Mark Twain Archive. Both exhibits were courtesy the Robert Slotta Mark Twain collection. Ron Powers eloquently presented the Keynote Address August 5th, which was followed by a sumptuous champagne dessert reception where Mr. Powers signed advance copies of his new Mark Twain biography, Mark Twain A Life. Robert Hirst, General Editor of the Mark Twain Project ("MTP") at the University of California, Berkeley provided an amazing glimpse into the intricacies of the work they do, while other members of the MTP introduced the crowd to the forthcoming Mark Twain's Writings Online web site. Candy Fresacher of Vienna, Austria provided maps of Vienna, related posters, & even brought Vienna cookies for everyone. Mark Dawidziak pointed out the many fascinating personal & professional parallels between Mark Twain & Charles Dickens. He also shared the CBS Playhouse 90 production of The Shape of the River, starring Franchot Tone as Mark Twain in its entirety. Before that, the audience saw Quarry Farm related excerpts from Sandra Bradley's Mark Twain documentary. Robert Slotta of Admirable Books presented his paper regarding Mark Twain's first book, which provided new information not contained in any bibliography or biography. Mr. Slotta's discoveries concerning the Celebrated Jumping Frog reveal Charles Henry Webb, the publisher, to have been exactly what Twain called him; "a liar, & a thief." It turns out the book was an instant, immense success. A cheap American paperback version (previously not known to exist, but now confirmed to) was quickly discontinued within the first two weeks of publication in the interest of maximizing profits. Mark Twain never saw a penny of those profits. Many prominent Mark Twain scholars became convinced by Slotta's presentation of the evidence that the historical record is in serious need of correction. More details about this situation will be posted on this web site later. Mark Twain impersonators McAvoy Lane & Warren Brown didn't perform, yet still made everyone think Mark Twain was actually present. McAvoy Lane did, however, present his paper "Sam Clemens' Route to Lake Tahoe and Manifest Destiny," which was excellently powerpointed & included handouts. There is much more to say about this wonderful conference. More details will be added as time permits, see www.elmira.edu for current Mark Twain activities planned. For now we close by sending our sincere gratitude & congratulations to Barbara Snedecor & the entire staff of the Elmira College Center for Mark Twain Studies for a job extraordinarily well done! May 25th, 2005 - The Mark Twain House opens the fully restored kitchen wing for the first time in more than a century! World famous chef Jacques Pepin created a sumptuous dinner for the benefit of the Mark Twain House & Museum which was a great success. For more details go to www.MarkTwainHouse.org . 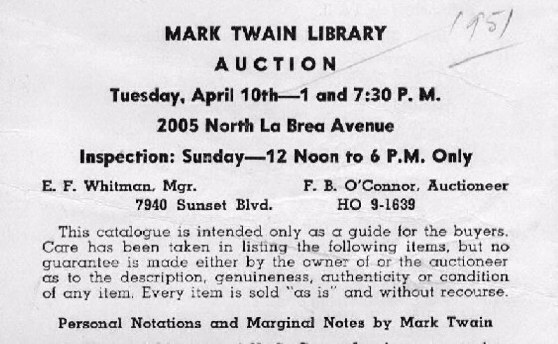 May, 2004 -- Quality Mark Twain remains very strong, a presentation copy first edition Jumping Frog fetched $114,000 and a set of his works inscribed to daughter Clara obtained $96,000. January 1st, 2003, 12am EST--- According to Robert H. Hirst, head of the Mark Twain Project at the University of California in Berkeley, publication rights of unpublished original Mark Twain material has just been placed in to the public domain. SPECIAL NOTICE: Please note that if any copies of unpublished material were obtained by The Mark Twain Project in 2001 or earlier, then that material was published onto microfilm and is copyright by the Mark Twain Foundation. 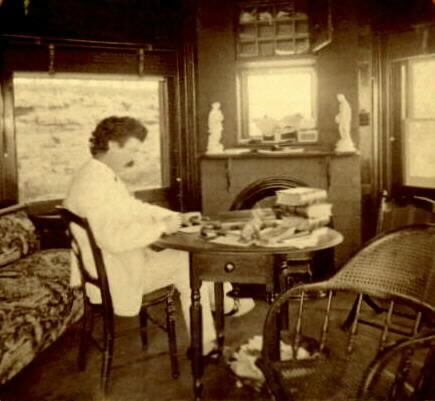 An Original Studio Photograph of Mark Twain circa 1898, likely of a portrait painted of him also circa 1898. This illustration is from an original turn of the century high quality photograph by a prominent photography studio. The quagmire here is that it appears to be a photograph of an extraordinary lifelike portrait painting by a very talented artist. So incredible is the lifelikeness of this portrait that it could easily pass as a genuine photograph of Twain himself to the untrained eye. One is left to wonder who painted this, and why this picture was taken. We would be very grateful for any information that can be had regarding this matter. Please e-mail Bob at: bob@marktwaincollector.com with any questions, answers, or comments regarding this curiosity. Elmira, New York is home to many things, but Mark Twain is almost without any question whatsoever by far and away the most important in terms of rank in American History. This spring the Elmira College Center For Mark Twain Studies has produced some of it's best programs yet. On Wednesday, May 8th Mark Dawidziak presented a paper titled "Horton Foote's 'The Shape Of The River': The Rediscovery of a Television Play About Mark Twain" at Quarry Farm. Mr. Dawidziak is television critic at the Cleveland Plain Dealer, and an author (Mark My Words Mark Twain on Writing, ISBN 0-312-14365-6, and is currently working with Foote on a special Mark Twain project. We will keep you informed here when more information is made available. The next lecture in the series was presented by Dr. Alan Gribben, professor & head of English and Philosophy, Auburn University at Montgomery, Alabama on May 15th, at Quarry Farm. Titled "New Shelves in Mark Twain's Library," it was a smash hit. Dr. Gribben is the world's foremost authority regarding books from Mark Twain's library, and is the author of, among many other things, Mark Twain's Library: A Reconstruction (out of print). This lecture was a super sweet treat to everyone who had even the slightest interest in anything Mark Twain once owned. Dr. Gribben has been a longtime friend and advisor to the Elmira College Center for Mark Twain Studies, and is largely responsible for having the Elmira College obtain many significant items including dozens of books from Mark Twain's library. The last lecture of the season was presented at Quarry Farm by R. Kent Rasmussen on May 22nd. Mr. Rasmussen is this season's Fellow in residence, and presented a paper titled, "How I Came to Write Mark Twain A to Z." Mark Twain A to Z: The Essential Reference to His Life and Writings [ ISBN 0-8160-2845-1 ] is truly one of the best resources anyone can turn to for information about Mark Twain, and is highly prized by Mark Twain scholars. Please call 607-735-1941, or write "Center For Mark Twain Studies / Elmira College / Elmira, NY 14901" (or e-mail at twaincenter@elmira.edu ) to help support them by becoming a member of the Friends of the Center for Mark Twain Studies at a very low fee for a very high cause. Once a very important Mark Twain club that was organized by the University of California at Berkeley to help make up for lost funding from the National Endowment for the Humanities, it hasn't been active in many years. 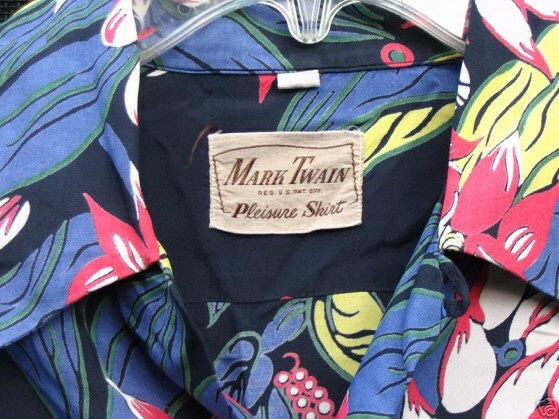 The Mark Twain project requires public support to maintain its very existence and the Mark Twain Luncheon Club was created for this purpose. If you are interested in contributing anything to The Mark Twain Project then we urge you to contact UC Berkeley direct at (510) 642-6480. Florentine Films together with WETA (Washington, D.C.) completed their four hour Mark Twain documentary, which debuted January 14th and 15th, 2002. Directed by Ken Burns, this documentary is well worth watching! Please bear in mind that it is a "made for TV" style drama, with special emphasis placed as much on tragedies as anything else, and the fact that Mark Twain can't be encapsulated in a mere 4 hours. Hal Holbrook holds it all together, making it clear he is as much of a Twain scholar as he is a Twain impersonator. [We only hope he would find the time to write a Mark Twain biography!] Mark Twain quotes are a major component used throughout the work. On the whole, the Burns/Duncan team produced a very good documentary about an extraordinary man, and we cannot find a better visual documentary to recommend. Other film documentaries are on the horizon, and when they dawn details will be provided here! Announcing a series of symposiums on American authors on November 29th, 2001, First Lady Laura Bush proclaimed, "Of course we started with maybe what a lot of people would say is our very most important author." 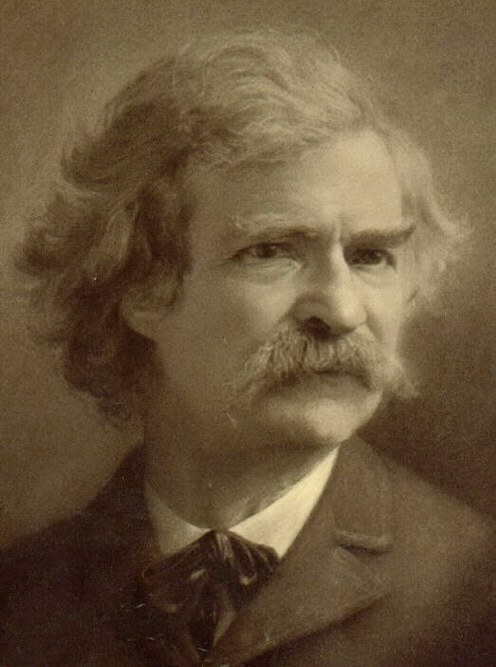 Mrs. Bush further complimented Twain and his genius, "His words and his wit are as fitting now as they were when they were written...Few if any of American writers could turn a phrase better than Mark Twain." Mrs. Bush then introduced Gov. John Rowland (R- Connecticut) who thanked Mrs. Bush warmly for her graciously handling the position of First Lady, and went on to proclaim how much his state of Connecticut supports Mark Twain. Ken Burns was then introduced, who previewed selections from his forthcoming Mark Twain documentary. A panel of scholars then made remarks and answered questions by some youngsters in attendance. Adults were barred from asking any questions, keeping in the spirit of educating our young, and also making sure the panel wasn't stumped, as more knowledgeable Twain scholars who could ask tough questions were also present. The celebration didn't stop there, however. Later that evening President Bush, his wife, members of his administration, and also several members of congress attended a very special performance of Hal Holbrook's "Mark Twain Tonight!" at the historical Ford's Theatre. There the crowd laughed at themselves as Holbrook shot Twainian insults at the Washington politicians, "All Republicans are insane. Democrats are not insane right now, they are busy rearranging their consciences." For the record, President Bush's favorite Twain quote is, "Always do right. This will gratify some people, and astonish the rest." More News Later. 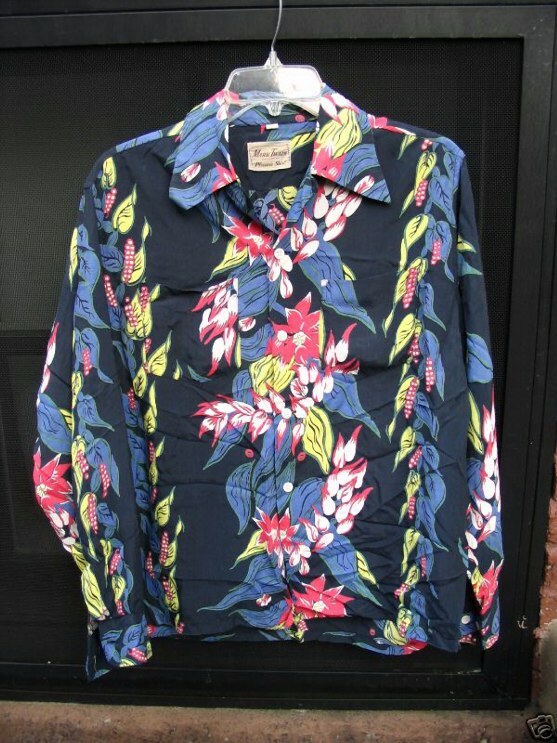 Please e-mail us at bobatmarktwaincollectordotcom (replace @ for at, and . for dot) to report any Mark Twain news.